Pharmacokinetic (PK) and pharmacodynamic (PD) measurements are key components in the elucidation of drug mechanisms. For biotherapeutics in particular, PK measurements heavily rely on immunoassay formats to determine post-dosing clearance. Many PD profiles also rely on immunoassay measurements of cytokines or other biomarkers in order to assess therapeutic efficacy. While traditional immunoassay methods are very specific, poor sensitivity in serum and plasma and limited dynamic range make accurate measurements challenging. This in turn impacts the ability of researchers to obtain the most information from their samples. The criticality of overcoming sensitivity limitations is especially pronounced in microdosing studies, or when therapeutic treatments are intended to strongly decrease a biomarker concentration. With the Research Use Only (RUO) Erenna® Immunoassay system, Singulex has enabled researchers to address these critical needs in PK and PD studies. The Erenna Immunoassay system utilizes a proprietary Single-Molecule Counting (SMC™) technology with increased detection sensitivity. This in turn has enabled the researcher to quantify biomarkers at levels far below traditional immunoassay formats. The patented Erenna Immunoassay system, which includes optimized immunoassay kits as well as reagents for researchers to build their own assays, offers sub-picogram per milliliter resolution, and a dynamic range of up to 4-logs. This sensitivity improvement helps minimize the number of unquantifiable or undetectable sample concentrations. The larger number of reportable concentrations enables better tracking of drug clearance, or enables sample stratification and a more robust therapeutic index. 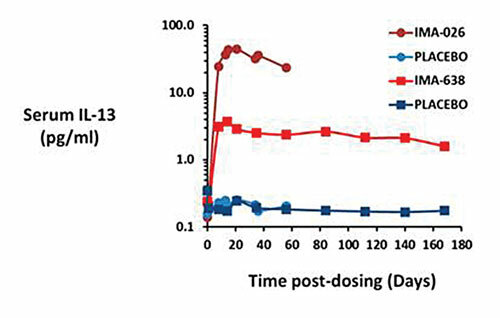 Here we present case studies demonstrating how digital high-definition Singulex immunoassays have allowed for the detection of lower levels of a drug to provide a more complete PK profile, as well as enabled the identification of unpredictable clearance patterns that were otherwise undetectable by traditional immunoassay methodologies. Traditional methodologies offer limited capacity for PK profiling, and are often unable to show the full clearance profile of therapeutic candidates. Traditional immunoassay formats may fail to report quantifiable or even detectable levels of the biotherapeutic if it is quickly cleared by the test subject. More sensitive immunoassays, such as those that are run on the Erenna platform, enable a researcher to follow therapeutic concentrations for periods long after many immunoassay formats would fail to quantify therapeutic concentrations. The higher sensitivity could also enable more robust stratification of individuals’ therapeutic clearance profiles. Better sensitivity could be an enabling method for microdosing experiments, where significantly lower concentrations of the therapeutic are administered for safety and efficacy purposes. These types of studies may have been impossible to do by traditional methods but can be measured using an Erenna Immunoassay system. Figure 1. 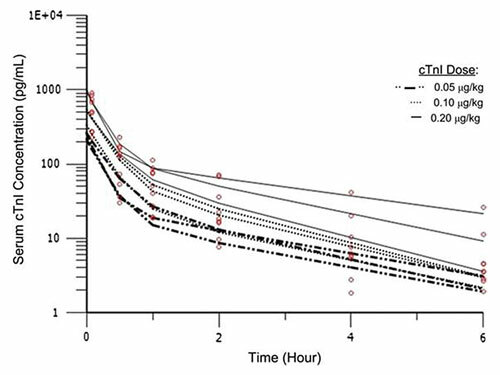 Case Study: cTnI PK Profile—The ability to establish and monitor baseline concentrations of serum cTnI in dog is essential to assessing cardiovascular safety of a compound in development. 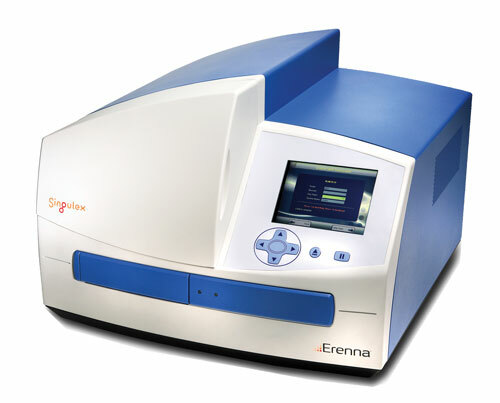 The Erenna platform can make measurements below traditional immunoassay formats and provide a more complete dosing profile. Dunn et al., Toxicological Sciences, 123, 368: 2011. Minor biomarker level changes may be of therapeutic significance. These could be early indications of damage, or offer indications as to why different individuals respond differently to a therapeutic. In many cases, the biomarker readout is a reduction in the presence of the therapeutic. There is a potential risk in these situations that the biomarker may fall below the sensitivity of the assay but still have a biologically relevant mechanism of action that could obscure study results. Enabling technology, such as the Erenna Immunoassay system from Singulex, improves the sensitivity over traditional methods and enables more complete biomarker measurements post-dosing. Figure 2. Case Study: Anti-IL-13 Biotherapeutics PD Profile—IL-13 (a biomarker associated with asthmatic inflammation) levels are potentially reduced with therapeutics. These levels will quickly fall below the sensitivity limits of other immunoassay formats. The Erenna platform enabled longitudinal assessment of serum IL-13 levels in treated and untreated subjects, and enabled differentiation between treatments that was not possible with less sensitive immunoassays. Gauvreau et al., Am J Respir Crit Care Med, 15, 1007: 2011. The RUO Erenna Immunoassay system from Singulex enables high-definition immunoassay results. Better biomarker assays can accelerate pharmaceutical, clinical, and life science research. Singulex has developed a broad range of ultrasensitive immunoassays against many biomarkers. Singulex also provides assay development kits to enable researchers to easily build their own immunoassays against specific therapeutics or biomarkers of interest. This enables better sensitivity and better quantification methods in most pharmacokinetic and pharmacodynamics measurements. Unless otherwise noted, Singulex products are for Research Use Only and not intended for Diagnostic use.